It wasn’t until weeks later when I was settled into temporary family digs in Pennsylvania, and it was clear I wasn’t going to be getting any temping work that I thought about Niagara. I hopped online, found a great deal, and realized in a crystalline moment that my passport was packed up tight in my file cabinet in the back of one of my three packed-to-the-gills moving-pod-container things resting comfortably in some warehouse 150 miles away. Sigh. 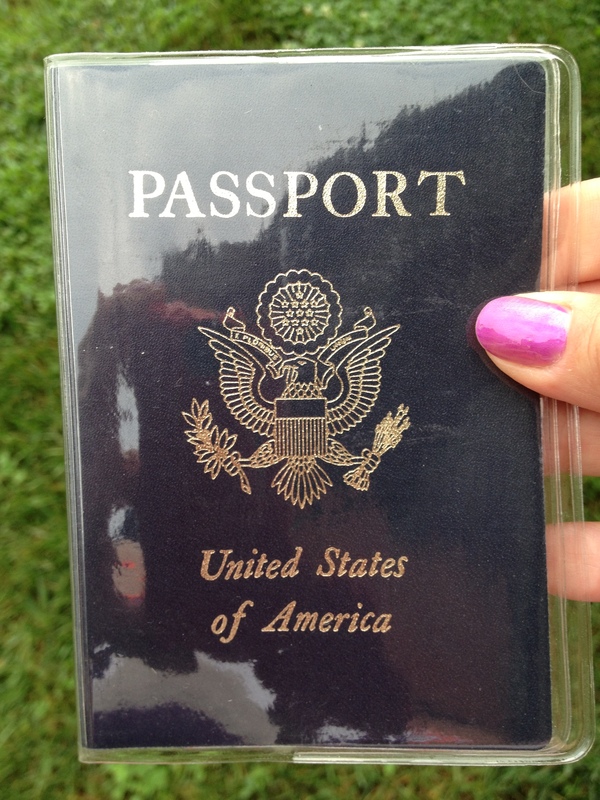 I wanted that passport. I was going to Niagara Falls, and it was going to be the Canadian side. I wasn’t driving all the way up north to stand on the boo-boo side of the Falls (sorry, USA, but you know it’s true). So, after much hassle, expense and tapping of family goodwill (thanks Pam and Karen! ), with passport in hand (and, believe me, that sucker could not have been packed any further from the door of the pod than it was unless it came out the other side), I was off to Niagara Falls. I was happy to find this little bugger. And it was amazing. Here’s a slideshow. You should definitely go. It’s unbelievably beautiful. And, I have to give a shout-out to my new heroine, Annie Edson Taylor, a school teacher and the first person to go over the falls in a barrel. With her cat. Annie Edson Taylor, first person to go over the falls in a barrel — with her cat! Plus, Niagara-on-the-Lake, about 20 minutes north, is known as a wine region in its own right, and I was there just before harvest. Niagara Falls isn’t known for its food so I didn’t expect much by way of food tourism — although, I have to say, my hotel had a wicked seafood pasta — and I’m not known for mapping my route much before I go on a trip, so I was surprised to see as I drove north that I was going pretty much almost right past Ithaca, New York. Of Moosewood Restaurant fame. Score! What a happy circumstance. I determined to stop there on my way home. Turns out I was also going right by Seneca Falls, of women’s rights fame, so that got added into the itinerary, too. Women’s Rights National Historical Park, Seneca Falls, NY. A big thank you to these women for their pluck and conviction (Women’s Rights Convention, Seneca Falls, NY). Plus, I ran into a couple other cool local delights. I got clued into a Binghamton, NY specialty by a Binghamton expat now in Maryland. Spiedies, a local specialty of cubed, marinated meat in a soft sub roll, have their own Wikipedia entry, their own balloon festival in August, and were featured in an episode of The Food Network’s “Unwrapped” (if you find the episode, let me know — I lost an hour of my life browsing their labyrinth website looking for it). You can buy the marinade here, too! 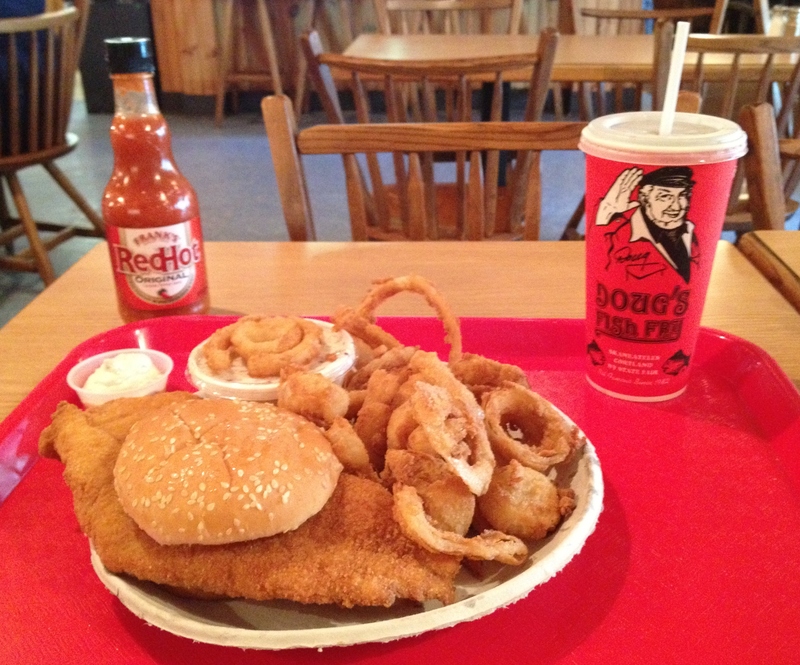 I also found this delight of a local eatery, Doug’s Fish Fry, in beautiful Skaneateles, NY, which is part of the Finger Lakes region. Very charming place. 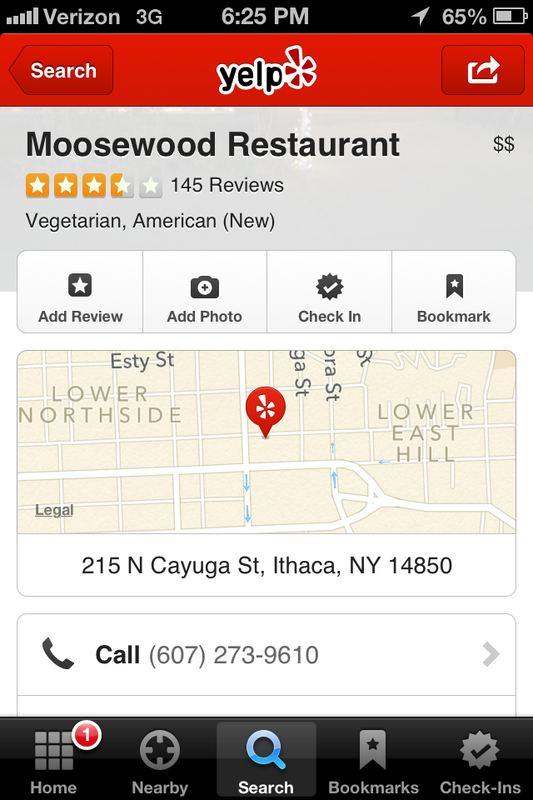 Now, on to the bad news: Moosewood Restaurant. Sigh. What can I tell you? Bon Appetit magazine named Moosewood Restaurant as one of the most influential restaurants of the 20th century. Dog-eared copies of their numerous cookbooks can be found in every used bookstore in Berkeley, CA. When they opened in 1973 they were cool, they were alternative, they were a collective, for goodness sake — they helped bring vegetarian cuisine into the spotlight. So it should be amazing to pop in for lunch if I’m in the area, right? Check it out for myself? The recent Yelp.com reviews didn’t bode well. 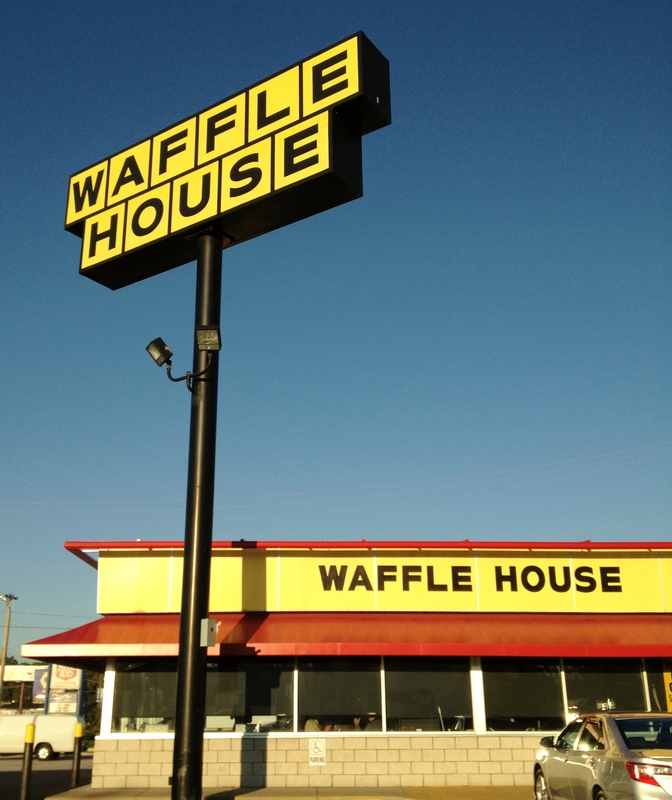 People complained of poor service, bland food, mediocrity in general. Surprising, but yelpers can be obnoxious so I do not let grumbling reviews dissuade me from going somewhere. 3.5 out of 5 stars for one of the most influential restaurants of the 20th century? Sadly, my experience was lacking. Moosewood and I got off on the wrong foot when I arrived, due to dilly-dallying on my ride down from Niagara Falls, at 3:00 in the afternoon. I was starving. They were closed. What? What kind of groovy, college town restaurant closes between lunch and dinner? I didn’t see that coming, but that’s my fault. It’s weird, and kind of lame, but still ultimately my fault. The front door was open, though, and there were a few people inside, so I popped in to ask if they were open. The guy behind the bar stared at me for a long second and then said they were open for dessert and drinks only. Ok, dessert it is. Anything is better than nothing. It went downhill from there. The staff was exceedingly unwelcoming and I was the only customer in there. The place was quiet as a tomb, which made me feel very awkward, like I had just walked in on a staff meeting or something. I had read something about their vegan chocolate cake, so I ordered that, along with a side of the ice cream of the day, banana frozen yogurt. I wanted to order a coffee, but since the server had already turned his back to me before I even finished speaking, I didn’t bother. It was all too weird. The cake arrived cold from the refrigerator. Yuck. I don’t like cold cake unless it’s meant to be cold, like a mousse or cheesecake. The plating was pedestrian and it had whipped cream on top. I thought that whipped cream was highly improbable on a vegan cake, so I tasted it. Tasted like whipped cream, but I couldn’t believe they would serve dairy on top of vegan cake without mentioning it, so I asked. My friend behind the bar stared at me doubly long this time like I was an idiot to ask if it was whipped cream when it was so obviously whipped cream, then asked me if that was all right. Awkward, and awkward. Good thing I wasn’t vegan or I’d have been pretty bummed right about then. I probably also wouldn’t have ordered frozen yogurt, either. A quick drive up the hill to see the lovely Cornell University campus. I ate my cake, which was average, and my banana frozen yogurt, which was not bad, and beat it out of there. While I was paying the bill (I had to stand there for a few minutes while the bartender made himself a coffee), I snapped a quick picture of what looked to be a draft of the dinner menu. 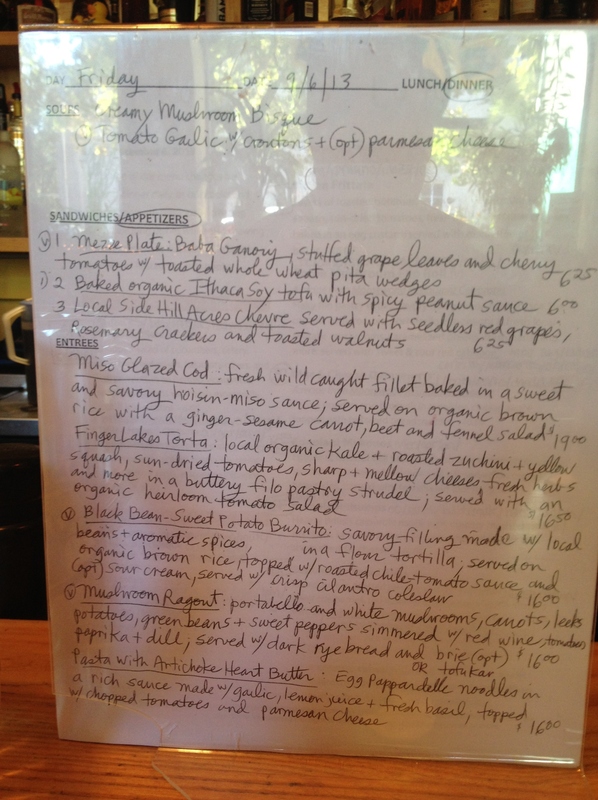 A server’s draft of the dinner menu — hard to read since I was snapping the picture quickly and furtively. As nonplussed as I was about my Moosewood experience, I was amazed by the beauty of the region: farms, lakes, wineries — and I know I barely scratched the surface. As for you, Moosewood: yikes. Sounds like you might need to get over yourselves. You might have had it going on at one time, but people don’t seem to be happy now. I compare this experience to a trip I made last year to Greens, in San Francisco, another vegetarian icon open since the 1970’s, and it’s like night and day: Greens was classy, the service was great, and the food was stellar. Way to keep it rocking, Greens! That’s how you stay on top. 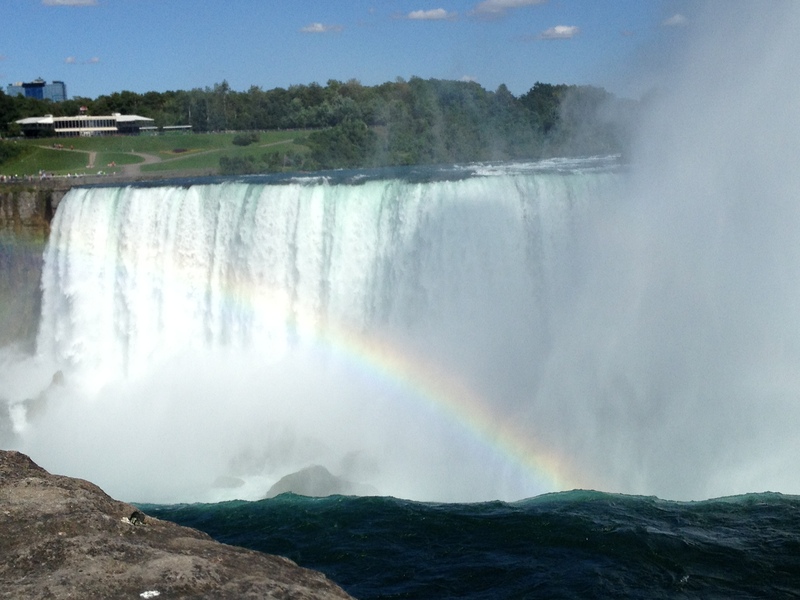 And as for you, Niagara Falls: love you. You were worth every mile.